Welcome to the Sisterhood of Military Moms! I am so thankful to my publisher Public Affairs for publishing “Be Safe, Love Mom: A Military Mom’s Stories of Courage, Comfort, and Surviving Life on the Homefront.” Further thanks for assisting me in creating this website devoted to THE BOOK and beyond. This is all a dream come true-a place for Military Moms scattered all over the world to connect with each other. I wish I could have you all over for coffee. We would pull out our knitting, quilting or scrapbooking and just share like women have done for centuries. What would we talk about? Recipes, news from home, and our children and grandchildren would fill our conversations. And because we are Military Moms bound together by that yellow ribbon of service and duty to country, we would talk about our pride and our fears that fill our invisible backpacks we carry everywhere. Here at www.besafelovemom.com I hope this will become virtual get together. We can be encouraged and support each other. We can have fun sharing what we are creating in our service members’ absence. We can inspire each other to go beyond, to learn to manage our empty nests and keep the home fires burning. We can encourage each other to be brave and to be strong. We can learn about volunteer opportunities and ways to hold ourselves together. On our Mom-to-Mom page we can discuss how we cope or support our children. And we can hear other Mom’s voices as they share their journey as a Military Mom. We won’t hide the tough stuff we moms might be dealing with. Information is the key to progress, so if you are struggling with bigger issues associated with military service we will try to provide resources and stories from moms who have lived though trials and made it to the other side. We will avoid politics like military sites do. Our children do their duty regardless of politics and we need to support our troops. We will be careful to keep our families safe by using OPSEC (See Military Mom Basic Training for a full description.) We will treat each other with care and grace because we know that carrying that Military Mom backpack is already a big enough burden. 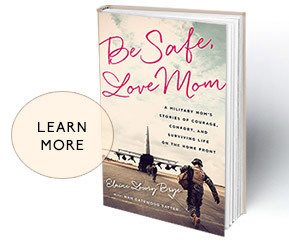 As the publication date of Be Safe, Love Mom is just around the corner I am so excited to have you read my stories of hope and survival as a Military Mom. I hope you are inspired and pass it on. And I am so happy to welcome you here-to my virtual front porch. Sit down and rest a while. You are not alone. You are among family-the sisterhood of Military Moms. I’m excited to check out this website! I have been an Army mom for just over a year but I am a veterans wife also. My son is serving on submarine. I am so proud of him. I wanted him to make a career in the Air Force, following me. I consider all of these brave men and women, HERO’S !